To be honest, there’s not a lot of difference between the two products and they’re easily confused. If you placed them side by side, you wouldn’t be able to tell the difference. They’re that similar they’re interchangeable in almost every use. On the surface you wonder why there are two products so similar on the market. But by looking into the areas where they are not interchangeable, the differences start to become clear. But what’s most shocking is that some of the differences can have a really big impact. So let’s have a look at the main differences between the two. The National Pesticide Information Centre (NPIC) sum up the dangers of Borax with one simple quote on this web page. So I dug a bit more into the archives and found this chart. These finding have also been corroborated by the Environmental Protection Agency (EPA) in their research document (Section II.A, page 3). They have rated Borax as “corrosive” to the eyes. When I read this, it shocked me. I literally stumbled over it too. I had no idea Borax was so dangerous for your eyes. As some of the common guides for treating insect infestations with borax or boric acid require you to puff out a fine layer of dust, this matters quite a lot. Not only are you at risk of getting some in your eyes while laying the layer, if any puffs up when you revisit the area you’ll be exposed then. There are some old boric acid guides recommending a boric acid solution as an eye rinse. As borax is quite interchangeable with borax, I hope no one finds this out the hard way. We strongly recommend you don’t get boric acid in your eyes, and doubly so for borax. This is the source for most of the confusion. Borax is mined out of the ground and boric acid is made from borax. 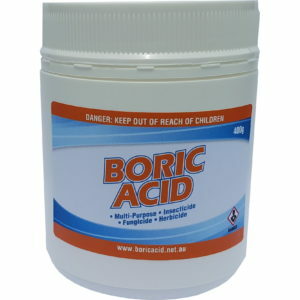 Boric acid is made by reacting borax with a strong acid, like hydrochloric acid. Borax is dissolved in boiling water and then an aqueous solution of hydrochloric is added. When the solution cools, boric acid crystallises. The boric acid crystals can then be filtered out. This is one of the main reasons why boric acid is used in the medical field. 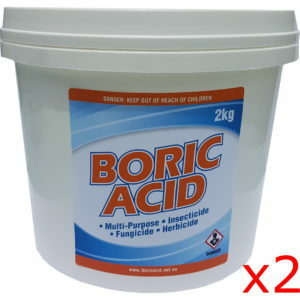 When produced in a laboratory environment, it is possible to produce boric acid of a much higher purity, making it suitable for pharmacological uses. This extra processing is also why boric acid costs a little more than borax. 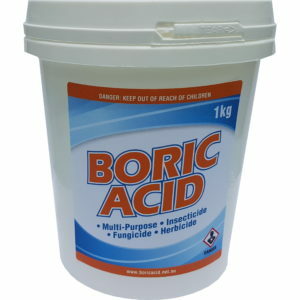 When considering the compounds themselves, boric acid has a slightly larger concentration of boron. 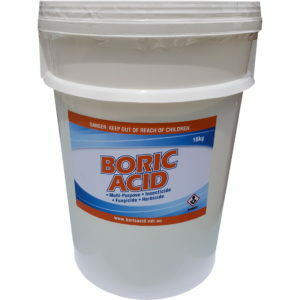 Boric acid has 17.48% (https://en.wikipedia.org/wiki/Boric_acid) and Borax has 11.34% (https://en.wikipedia.org/wiki/Borax). Farmers sometimes need to raise the boron level in their soils and this is why they choose boric acid over borax. Additionally, borax retains 10 water molecules which increase the bulk of the product. 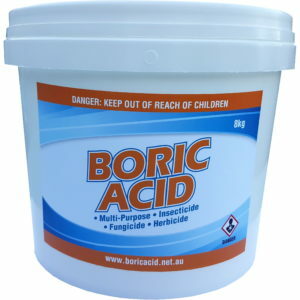 The molecular weight of Boric acid is 61.83 (https://www.google.com.au/search?q=what+is+the+molecular+weight+of+boric+acid), and Borax is a whopping 381.43 (https://www.google.com.au/search?q=what+is+the+molecular+weight+of+borax). Borax is mined in rock form and needs to be crushed or broken down to reach powder form. It does eventually do this by itself when it dries out but it takes a while and you’re still left with much smaller rocks. But on the whole, it’s pretty tough. Boric acid never really gets the chance to get into rock form. It’s produced as crystals which, even on their own, are much easier to work with. 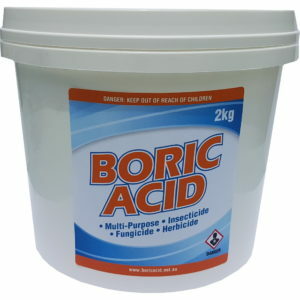 If you want to add Boron and only Boron to whatever you’re doing, then boric acid is by far the best choice. It only contains Boron, Oxygen and Hydrogen. Borax (also known as sodium borate, sodium tetraborate, or disodium tetraborate) contains two Sodium (Na) molecules and accounts for 12% of the molecular weight. Sodium increases the salinity of soil and water. This in turn affects nearby plants and wildlife. It is also a big concern for farmers. Boron is an essential micronutrient for plants and they add it to their soil while plowing and also as a foliar spray. Being able to do this without Sodium is essential. There’s enough Sodium going around without adding more. I expect your response to this is “So what?”. But this matters; a lot. Like I said earlier, Borax contains 10 water molecules. Over time, borax will lose some of these water molecules and “dry out”. The loss of these water molecules is results in the concentration of the other elements increasing. This means you won’t accurately be able to measure how much Sodium you’re adding, for example. The other issue with borax drying out is that it becomes rock hard. Borax in this state is virtually impossible to work with. You can’t easily dissolve it or use it as a powder around the house. Once borax gets to this stage it’s best to throw it out (and buy some boric acid). And a bonus … 7. You can make kids slime without Borax. Use boric acid instead. With all the reasons above, why use borax for kids slime? You can use boric acid instead. Kids slime is awesome to make, and it’s pretty easy to make too. We have a guide showing you how to make slime without borax and with boric acid. I hope this information has been helpful. 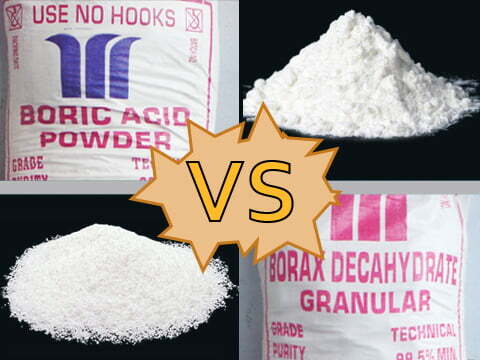 I’d love to know what you thoughts are on the whole boric acid/borax debate. You can do that by leaving a comment below. This is the best online source for information about borax and boric acid. Thank you for taking the time to give your readers a comprehensive list of differences, especially the table on the dangers of both. thanks for the time and effort.. like some one already said yours is best explanation on-line with relevant differences.. thanks again.